One of my pet peeves in wine is the business of labels. I get that in a sea of competition it is important for a producer to distinguish his wine from the others. Ever since Far Niente introduced its embossed 50-cent label in the 1980s, there has been a rush to out-do each other. Consumers can be attracted to a wine’s label if they have little knowledge of what is actually in the bottle. So, makers of such ridiculous wine as “Cheap Wine” or “Mommy’s Time Out” know that shoppers find a label funny and just enough to convince them to buy it for themselves or as a gift for someone else. The front label of Rodney Strong’s Upshot blend. Most producers, however, even squander the opportunity to help the consumer with the contents on the back label. Warnings about sulfites, alcohol content, where the wine is made, etc. fulfill government regulations — but there’s often nothing about grape varieties, oak aging or tasting descriptions. Producers should use as a model a new label from Rodney Strong. 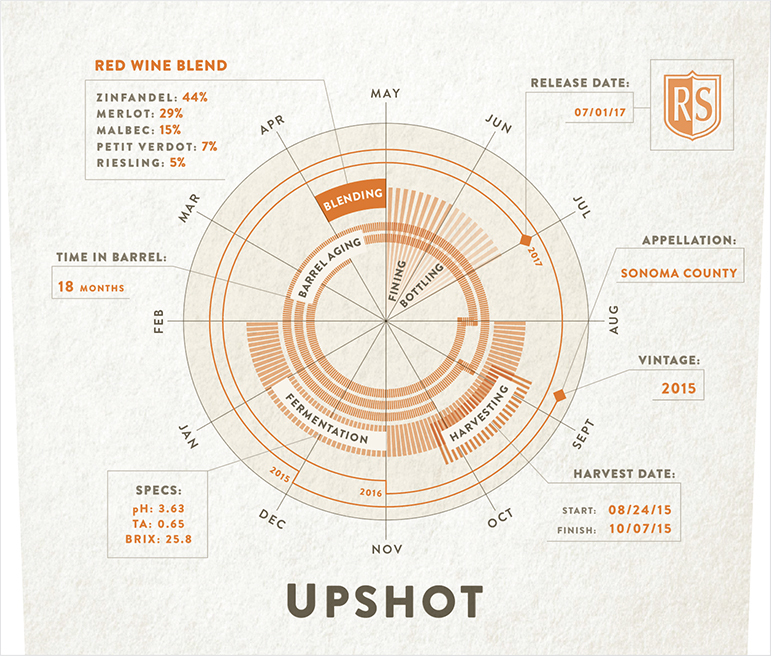 Upshot — a red blend — is more than a pretty face. Its front label has the blend, time in barrel, specs, harvest date, timeline and more. Credit this to director of winemaking Justin Seidenfeld who gets it. One can make the claim it’s more information that he or she needs to know, but who can complain? Not me.